When considering the impact a mine can have on wildlife, few believe it could be positive. In the case of the Giant Tree Frog and the Yellow Tree Frog in the Dominican Republic, critical research led by Pueblo Viejo Dominicana Corporation (PVDC) contributed to their reclassification from endangered to vulnerable by the International Union for the Conservation of Nature (IUCN), a process known as down-listing. PVDC is the joint venture company (60 percent Barrick, 40 percent Goldcorp) that owns the Pueblo Viejo mine. The research is part of the PVDC El Llagal Offset Program (ELOP), which was established in 2008 to ensure compliance with PVDC’s environmental permit and International Finance Corporation guidelines that require companies to mitigate potential impacts on wildlife habitat. PVDC has committed $8.3 million to the program. 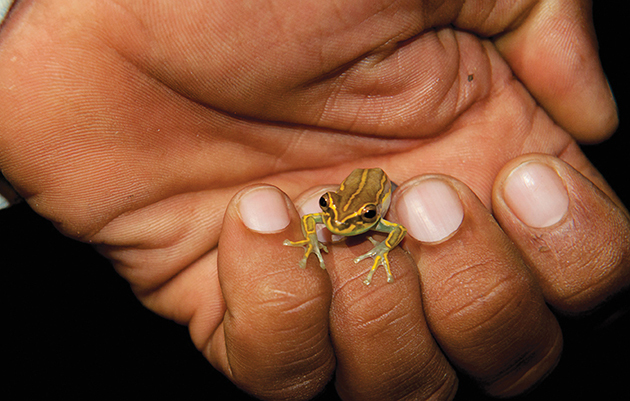 The program, currently led by PVDC’s Biodiversity Advisor, Pedro Galvis, includes the establishment of a captive breeding program, studying the reproductive and feeding habits of various tree frog species, and a telemetry program to track the movements of the frogs and understand habitat requirements. While the program was an integral part of developing the Pueblo Viejo mine, the research has also contributed to a growing scientific body of knowledge about these poorly-understood amphibians.